How realistic is it to have spacecraft brightly illuminated when journeying the solar system? This is a great question, but before we get to the meat of your query, I want to clear up two misconceptions that are present in the question itself. The first is that the Moon has something to do with the day/night cycle. Days and nights occur because the Earth is spinning rapidly on its own axis. The Sun, which is relatively stationary with respect to the Earth on the timeframes of a few days, continues to shine from the same point. As the part of the Earth that you or I live on rotates to face towards or away from the Sun, we get day and night respectively. The Moon orbits much, much slower around the Earth - approximately once every month. The Moon can occasionally cast a shadow onto the Earth, but that’s a rare event we know as a solar eclipse. The second is why you sunburn at altitude. You absolutely are more prone to sunburns at higher altitudes, but it’s not because you’re significantly closer to the Sun. The Sun is 93 million miles away - getting a single mile or two closer isn’t going to make a significant change to the amount of sunlight that your skin’s getting. What happens instead is that you’re rising above some of the protective layer of our atmosphere, which allows more ultraviolet radiation to reach you. This UV radiation is what triggers a sunburn, and the more atmosphere above you, the more protected you are. If you’re on a snowy mountain, you have the additional complication of being able to get sunburned in really strange places, like the underside of your earlobes and the bottom of your chin, because of the reflected light off of the snow. With those two points addressed, your question about lighting in space is an excellent one. There’s a couple things to think about with lighting, so let’s begin with a spacecraft which is near the Earth. If you are in a position where nothing is blocking the sunlight coming your way, you would be constantly bombarded by the Sun’s rays, exactly as you suspect. However, this is an extremely harsh lighting system - with no atmosphere in space to diffuse the light a little, spacecraft are in pure sunlight or deepest shade. If a spacecraft is moving around the Sun, that means that the sunward facing side of the spacecraft would be illuminated, and the other half of your spacecraft would be in shadow - triggering a pretty intensive temperature gradient between the two sides. As a point of reference, the temperature on the surface of the Moon swings between 224F (106C) and negative 298F (-183C) when the surface is illuminated versus when it is in shadow. This temperature cycling causes stress on most materials you could build a spacecraft out of, and is a challenge we face already as a moderately spacefaring species. The International Space Station, which orbits around the Earth, alternates between spending 45 minutes in the shadow of the Earth and 45 minutes in direct sunlight. Without intensive, intensive insulation, our astronauts would alternate between freezing to death and boiling to death. We have to manage this same situation on a smaller scale for space suits; in the sunlight, your suit has to keep you cool and protect your eyes from glare. In the shadows, it must keep you warm. These considerations will only get worse as you get closer to the Sun, or really around any star. As we proceed inwards, closer to the sun, the sunlight gets more intense, and the amount of work you’d need to do to stay cool would increase. The cool side of your craft wouldn’t get any colder, but the temperature stress would get more severe between the sun and shaded sides of your craft, so your insulation would have to get much better. This intensity doesn’t change linearly though - if you got twice as close to the star, the sunlight won’t be twice as intense. It will be four times as intense. This works just as well in the other direction - go twice as far out in the solar system, and your sunlight will drop off by a factor of four. Go four times as far, and you’re dealing with light intensity 16 times fainter than you have at the distance of the Earth. However, the Sun is very bright. Jupiter is 5.2 au - and Neptune at 30 au. At 5.2 au, you’re dealing with sunlight 27 times fainter than what we receive on Earth. It’s still going to be the brightest thing in the sky. Neptune is much further, but even at 900 times fainter than the Sun appears from an Earth distance away, it still hasn’t faded to anywhere near the relative faintness of the full moon in the sky, and you can do a lot in the light of a full moon, visibility wise. The way that astronomers measure brightness is with a counterintuitive system called a magnitude, where 1 magnitude is about a factor of 2.5 in brightness. Every magnitude is multiplicative, so five magnitudes is a difference in brightness of a factor of 100. A difference of ten magnitudes is a factor of 10,000 in brightness. 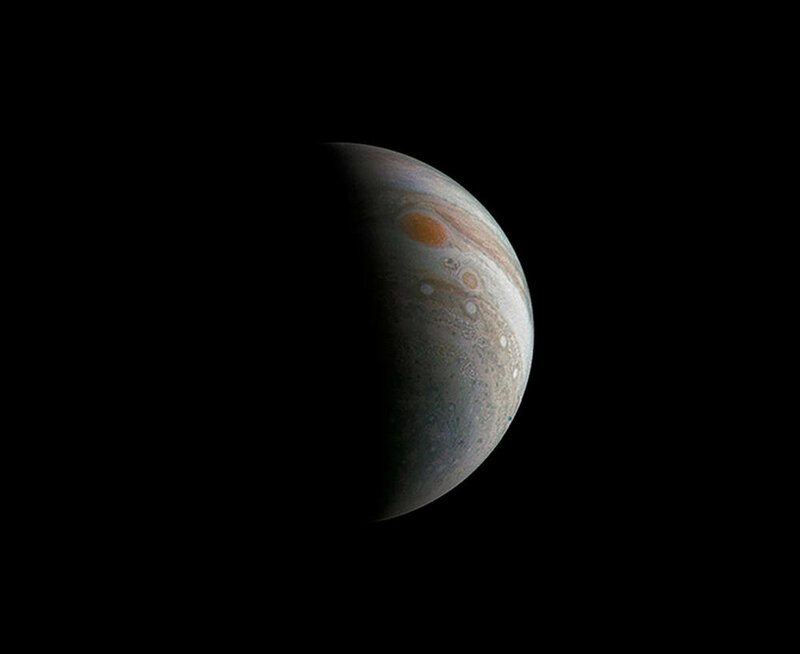 At Jupiter’s distance, then, the Sun will appear about 3.6 magnitudes fainter than it does from the Earth. At Neptune’s distance, it’s something like 7.5 magnitudes fainter. The brightest star in the night sky, Sirius, is 25 magnitudes fainter than the Sun, so even at the distance of Neptune, the Sun will appear more than 10 million times brighter than Sirius appears on Earth. The full Moon, which I mentioned earlier, is fourteen magnitudes fainter than the Sun, so the Sun would be shining on Neptune about 390 times more intensely than the full moon. If your fictional craft is within the bounds of a solar system then, I’d say having the craft be brightly illuminated on one side is pretty reasonable. If you’re going beyond that, though, you’d start to descend into full darkness. You’d have to be very far away from our star before the Sun sank to the brightness of Sirius. In fact, you’d need to be almost 1.5 light years away from our star. The spaces within the stars, which is the majority of the Milky Way Galaxy, are going to be very dark. In those places, the only bright lights will be the ones you bring with you. You probably would want to have a few spotlights around, if any of the crew ever has to go outside for any kind of repair operations, but it wouldn’t have the same aesthetics as the harshly lit side of a spacecraft that many shows like to go for. When we talk about the Universe's first second, what do we really mean? This is a really fun question, because the answer is that these time points you’re seeing are for time as we experience it here on Earth, where we’re trying to use an objective ruler of time to describe how rapidly things were changing during those early moments of our Universe. All measurements of time are based on what we use here on Earth, where we humans first developed our timekeeping methods. The second is now a unit of measure used for all sorts of things, though pretty rarely in extragalactic astronomy (with a few exciting exceptions like events that trigger gravitational waves) because the distances involved often mean things happen on billion year timescales. 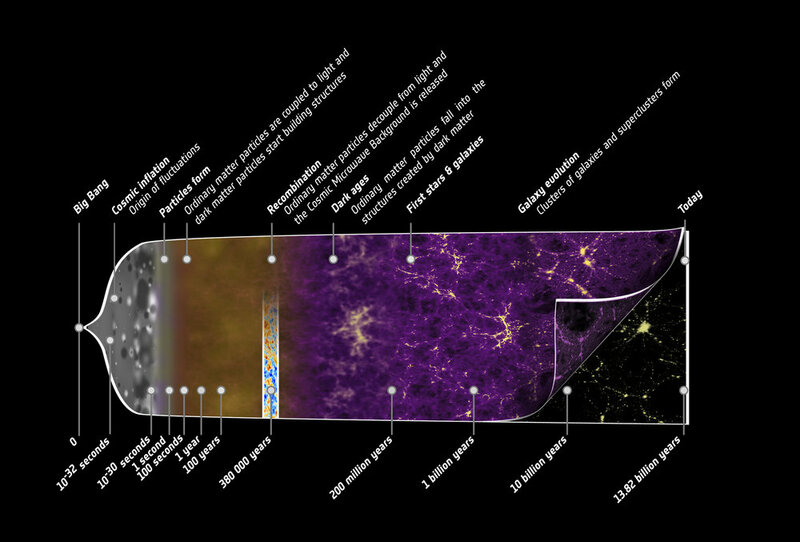 But when we’re talking about the very beginning times our Universe went through, a lot of things did happen in the first second - the Universe underwent a lot of dramatic changes in that first second. It went from a soup of energy to filled with protons and neutrons in that time - a dramatic change! And when we say this, we really do mean the second that you could watch tick past on a watch. This second comes from taking the speed of our Earth’s rotation, and dividing it into twenty four hours, dividing each hour into sixty minutes, and each minute into sixty seconds. It’s that second, 1/86,400th of an Earth-spin, that we use to describe the initial changes of our Universe. It’s fun to think that a fluke of angular momentum that gave us (approximately) a 24 hour day also gave us a useful metric for describing the early state of the Universe in precisely the units that we do. As time has wound on, we humans have sought to make our units of measure ever more precise. To do this, we often wind up redefining our units in terms of something more fundamental than where we had begun. The meter was redefined to be the distance that light travels in 1/299,792,458th of a second instead of “one ten-millionth of the distance from the equator to the North Pole”, and the kilogram was recently redefined to be a function of Planck’s constant, instead of a very specific, carefully guarded, lump of metal in a vault in Paris. The second has also undergone this transformation. As we measured the Earth’s rotation to higher and higher precision, we encountered the need for leap seconds to account for the fact that our Earth’s rotation is intrinsically slowing by a tiny, but measurable amount. Instead of using the Earth’s rotation speed, then, a more fundamental, reliably measurable feature of our Universe was adopted as the official definition of a second - the length of time it takes a cesium atom to vibrate between two hyperfine states 9,192,631,770 times. While this may seem like a much more complex unit of time, it’s actually a better definition in that anyone, anywhere in the universe, should be able to measure this unit of time consistently. During this redefinition of the second, the length of a second wasn’t changed, but now we have a more persistent method of measuring it. So that first nanosecond (10^-9) of the Universe is the same length of time it takes a cesium atom – in a vacuum, at absolute zero – to vibrate 9 times. Is there lightning on Mars? There is lightning on Mars! Or at least, something like lightning occurs on Mars. In 2009, the first detections of lightning strikes on Mars were recorded, confirming something that planetary scientists had suspected already - electricity should arc through the Martian skies. We knew a fair amount about Mars’ weather patterns even before detecting lightning, from a combination of orbiting spacecraft and our landers on the surface. 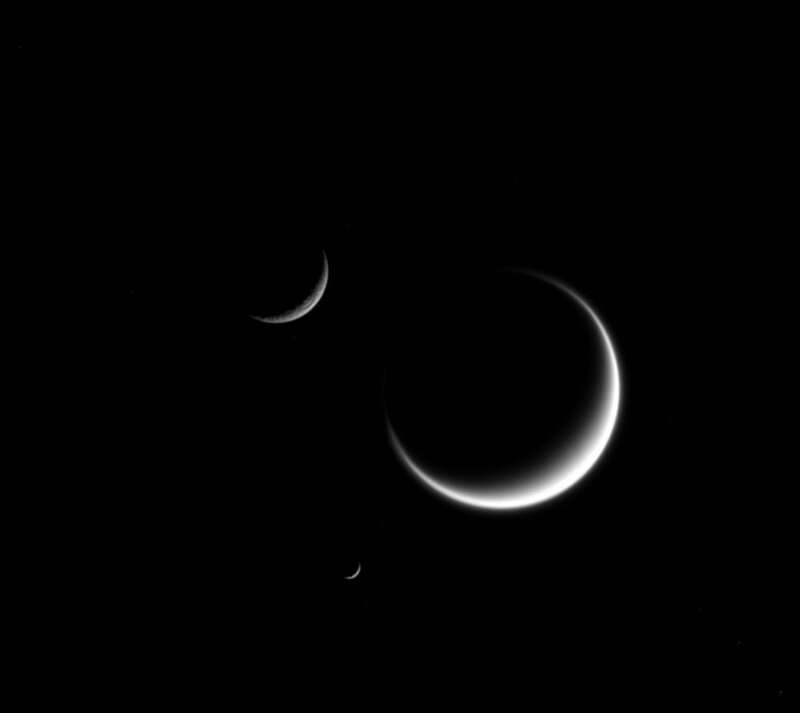 These outposts have painted a picture of a thin atmosphere frequently tumbled into large dust storms. Mars has huge annual storms which can envelop the entire planet, and other strong storms that pop up irregularly through the year. On top of that, the dust on Mars is extremely fine, so once you begin to swirl it around in a wind, it’s reasonable to guess that the dust particles will start to rub on each other, and as you do that, you’ll start to build up an electric charge. This static charge does more than just gradually build towards lightning; it’s also part of why the Mars rovers get so dirty. The rovers are dealing with more than just a fine sifting of dust falling out of the atmosphere, which a light breeze might easily remove; that dust is stuck to them like packing peanuts stick to your hands. It takes a stronger breeze - a new storm, or a wandering dust devil - to remove some of that dust, and it’s something that the long-lived Spirit and Opportunity rovers were both able to make use of on a couple of occasions. However, as much as dust devils can help you out, they can also do the opposite, dumping more dust on top of your solar panels, which, for a solar powered craft, will limit the amount of energy you have available to do science with, and eventually drop the craft below the threshold of power it needs to operate. This is the current theory for what happened with both Spirit and Opportunity. 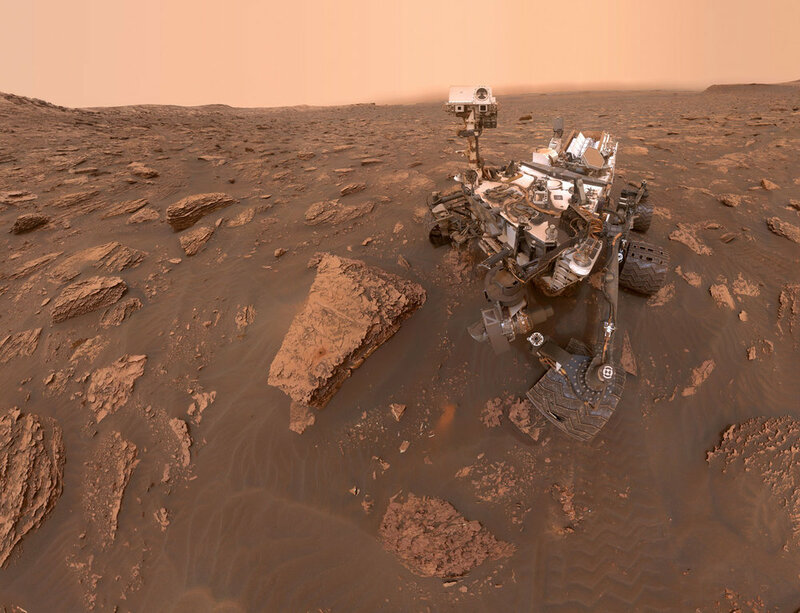 The Curiosity rover is less affected by this particular issue since its power comes from radioactive decay, but Curiosity is still fully coated in the fine Martial soil. This dust is actually a concern for human exploration of Mars - it’s going to be hard to fully remove this dust from spacesuits, and breathing in a fine particulate is never good for your lungs. The lightning itself is actually less likely to be a hazard to astronauts on the surface of Mars than the dust is; for one I would expect any humans on the surface of Mars to take shelter during these bigger storms. Unlike what was presented in The Martian, even the 60 mph winds that can occur during a dust storm wouldn’t feel as powerful as a similar wind on Earth, since the atmosphere is so much thinner. The air simply wouldn’t exert the same pressure against you in the same way. Even on Earth, the likelihood of being struck by lightning is very low, and on Mars the best guess is that the lightning would not really resemble the large bolts of lightning we see here on Earth. More likely is that this lightning would resemble the arcing jolts of electricity you can create by shuffling along in socks on carpet and then touching a doorknob. In a dark room, you can see the filamentary discharge of electricity between your finger and the doorknob. On Mars, you might expect to see little flickers of electricity arcing between parts of the dust storm, faintly lighting up the night sky. To be a hazard to an astronaut or a rover, you’d have to be very, very unlucky. Sign up for the mailing list for updates & news straight to your inbox! Astroquizzical is a book! Check here for details & where to order! Want to see this post a day early? Become a patron on Patreon! Don’t want to become a patron, but do want to support? You can make a one-time donation via Ko-Fi! What would happen if the amount of light reaching the Earth from the Sun were cut in half? We’ve tackled a very similar question to this before here at Astroquizzical; check out this post! In that post, we explored what would happen to the Earth if we could slice the Sun in half. And because cutting the Sun’s matter in half doesn’t translate to a slice in brightness of one half, it’s a pretty dramatic shift for our solar system. However, if we don’t go quite as far with our solar slicing, but instead just drop the brightness of our sun by half, we’ve actually only removed 18% of the mass. This is still a relatively massive star, at 82% the mass of our Sun, but that’s enough to change the distance from the star where liquid water is stable. As the mass and brightness of a star decreases, that zone of possible liquid water (usually known as the habitable zone) shrinks to a smaller and smaller shell around the star, but because we’re changing the star by a smaller amount this time compared to the earlier post, the habitable zone won’t shrink all the way down to Mercury’s orbit - it would sit closer to where Venus is now. The Earth’s orbit might still fall within the bounds of the habitable zone, but it’d be more in the position that Mars finds itself in now - much colder than Earth now, but able to sustain water under certain circumstances. Our Sun won't be dropping in brightness anytime soon - on the contrast, as our Sun ages, it becomes slightly brighter, increasing in brightness by about 10 percent every billion years. As it does, the habitable zone around our star has been gradually expanding outwards, and at some point in the next billion years, the Earth will exit the habitable zone entirely. Want to see this post a day early? Become a patron on Patreon! Don’t want to become a patron, but do want to support? You can now donate via Ko-Fi!